Artists imagine a nation brings together figurative works by 36 artists from the 1930s to the present. Displayed in a special architecture designed for the ICA Singapore’s largest lower-level galleries, the exhibition presents diverse views of local people and places. 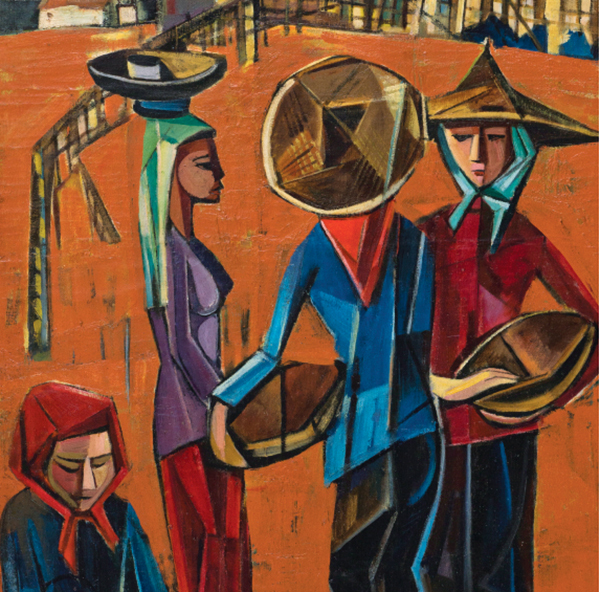 Highlights include a series of unusual figure paintings in gouache on paper (c. 1950) by Lee Cheng Yong, and street scenes in oil on small boards (c. 1950s) by Kuo Ju Ping. Contemporary works include major paintings in oil and drawings in ink by Tang Da Wu, and landscapes in ink and watercolour by Lim Tze Peng and Foo Chee San. Seah Kim Joo’s majestic five-panel Untitled [Malayan life] (1968) in batik and mixed media is accompanied by panoramic works by Chia Yu Chian, Koo Kweng Kwang and Khaw Sia. Of the more than 80 works on display, a number have never been exhibited.